I went into Wolfenstein 2: The New Colossus high on the idea of Nazi-killing. From a combat and stealth perspective, I had a good idea of what to expect, and I looked forward to dismembering Nazis, using the game as an outlet for all the rage I avoid sharing about this topic over social media. It doesn’t disappoint; there is some damn fine Nazi killing from start to finish in Wolfenstein 2, but at the same time it’s so much more than that. There is a segment in Wolfenstein 2: The New Colossus where William “B.J.” Blazkowicz transitions from a murderous, Nazi-killing rampage, to being exhausted and vulnerable in the arms of a loved one in seconds. 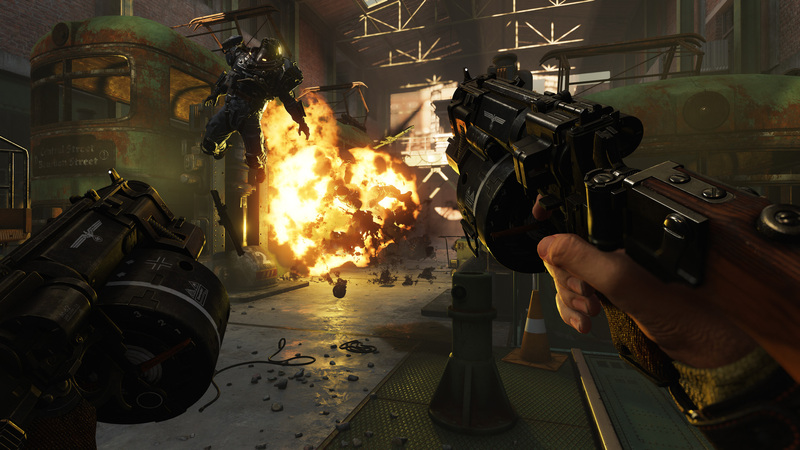 It makes Blazkowicz feel incredibly human, and it reminds the player that behind every act of brutality is a person who has their own collection of fears, desires, and vulnerabilities. In the case of a protagonist, this is a comfortable realization for gamers. We like to see the human side of our heroes. In Wolfenstein 2, however, players will come to see that it’s not just hero’s that are human, but also the monsters they fight against. What caught me off guard was how quickly MachineGames turned Wolfenstein 2: The New Colossus into a deep, emotional rollercoaster. Within 10 minutes, I cared more about Blazkowicz than any other video game character I’ve encountered this year. In fact, I can’t recall being as heavily into the journey of one since helping Geralt track down Ciri in The Witcher 3: Wild Hunt. In Wolfenstein 2, every mission felt relevant to the ultimate goal, and I bought what MachineGames was selling right from the start. This is all done through a series of early cinematics. The events of The New Order have left Blazkowicz near death. He begins to have flashbacks to his childhood where we are introduced to his loving mother and abusive father. We can see that this man’s war has been raging his entire life and, when he believes he is about to die, he wonders if he has been good. Has he done enough to get into Heaven? I was nearly in tears after this sequence. Unfortunately for B.J., that eternal rest he seems ready for must wait. Frau Engel is back and pissed about what happened to her face. She’s looking to kill not only Blazkowicz, but everyone he cares about as well. Weak and near death, he must once again put his physical pain and emotional exhaustion aside, this time to battle the Nazi regime on US soil. The gameplay mechanics in Wolfenstein 2: The New Colossus became almost secondary to me as I found myself more and more invested in the story. However, they are passable. Players can still choose to try and go in blasting with dual shotguns, or take the stealth approach and work their way through each encounter unseen. I usually started with stealth and tried to take out the Kommandant, but would screw something up eventually and then be forced to get loud. MachineGames gave me a small but enjoyable arsenal of weapons to crush my enemies with, and each one had strengths and weaknesses that helped or hindered depending on what fresh Nazi armored beast I was facing at the time. The weapon customization took a step forward in The New Colossus. 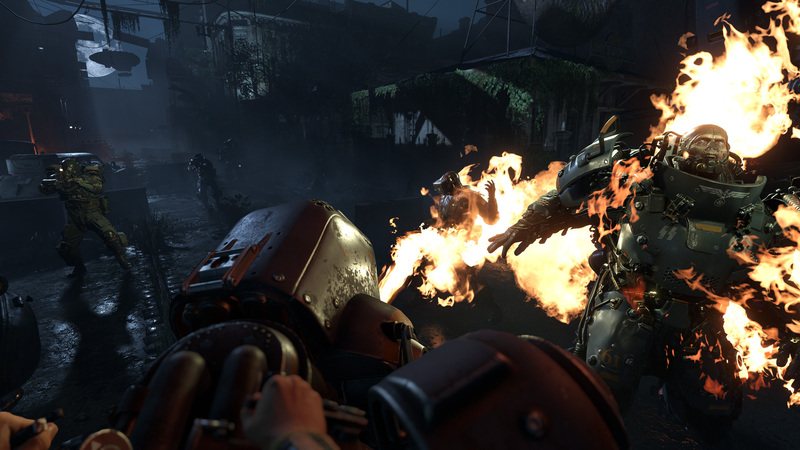 In The New Order, players had to find specific upgrades in the world, and could only do so when MachineGames allowed them. In The New Colossus, you find Weapon Upgrade Kits, and can apply them to any gun, upgrading any one of three things on each one. You get to play your way through the entire journey, and I appreciated that. What worked even more flawlessly was the way perks were handled. The game has a total of 18, all of which you can work towards at the same time. There is no choosing one or the other. Each one simply comes with criteria that, if met, gives you a bonus. If you lean towards the stealth side of things, you’ll find that you’re unlocking the bonuses of stealth perks much faster than combat perks just by using a stealth play style. You’re rewarded for playing the way you want to and don’t have to spend too much time in the menus making decisions. If there is one thing that troubled me a little, it was that it seemed like Blazkowicz couldn’t take as much damage as he could in The New Order. I found myself in gun battles that featured more peek-a-boo than face to face brutality. It wasn’t terrible, but I thought B.J. felt a bit squishy for those that like to see the whites of their enemy’s eyes when they blast them straight to Hell. You can again overcharge his health, which helps, but the base health he felt a bit weak. A few times I tried to blast through several foes, I died quickly. I had to adjust my approach to one where, if I was caught sneaking about, I’d retreat and force my enemies into a kill zone where I could survive. Maybe it’s a skill issue with me, but any encounter that featured a guns blazing approach had the potential to hand me a dozen or so deaths in a short amount of time. This could be a turn off for those that dislike stealth. A possibly unpopular opinion is that there are too many collectibles in the game. I believe there are close to 300 of them in total. There are 150 readable collectibles alone. Sure, it adds to the game to read the journals of friends and foes alike, but collectibles lose their prestige when there are too many. As it is right now you’ll bump into one about every 10 feet, and it won’t be long for most players to just ignore them. The New Colossus isn’t alone here. Most games tend to do volume over quality when it comes to collectibles. I don’t feel it takes away from the overall experience of the game and wouldn’t adjust the score over it, but as someone who needs to find all the things, I was irked. What The New Colossus does get right is the length of the campaign and its inclusion of Uberkommandant missions. With the stealth approach, I took about 15 hours to work through Wolfenstein 2, but you could easily reduce that if you just used the rampage approach to every encounter. Some missions took me over an hour to complete as I scoured levels for secrets and hidden areas, but quick gamers could power through those same levels in 30 minutes or less. The Uberkommandant missions are optional side quests that you unlock just beyond the midpoint of the main story. These are accessed by killing Kommandants, taking Enigma Codes off their bodies, and then messing about with the Enigma Machine to reveal the location of an Uberkommandant. These side quests take you back to areas previously explored in the main story, but you get to access parts that were locked before. It all feels like a great hunt for high-ranking Nazi personnel, and does a fine job of giving you a bit more to do after the game is over. It also lets you fully explore those previously traveled main story areas in case you’re trying to hunt down the ridiculous number of collectibles. Further into the game players can choose from the Constrictor Harness, Ram Shackles, and Battle Walkers as a permanent Contraption. I won’t spoil why these are introduced, but each offers a different perk that allows you to approach situations in a unique manner. Unfortunately, your decision really doesn’t matter that much. My first opportunity to use one of the Contraptions was when the game needed me to get into a room that, at first glance, was seemingly inaccessible. I quickly noticed that there were three ways in, one for each Contraption. No matter what road you chose, the destination was the same. I would have liked for MachineGames to make my choice matter a bit more. Give me a reason to fire up a second attempt of the game because there are things I couldn’t discover with the Constrictor Harness, but could attempt with the Battle Walkers. While there were certainly things related to the gameplay that didn’t amaze me, most of it went unnoticed while I was playing. I was so completely blown away by the voice acting, cinematics, and writing that each mission became a means to get to more of the story when it was over. The incredible performances by the cast of voice actors had me hitting up Google for their names time and time again. Brian Bloom is masterful as Blazkowicz, and you know it in the first five minutes. Prior to Wolfenstein 2: The New Colossus, Ashley Johnson and Troy Baker in The Last of Us were two of my all-time favorite performances. Personally, I believe that Brian Bloom surpassed both performances with his portrayal of Blazkowicz. It doesn’t stop there. 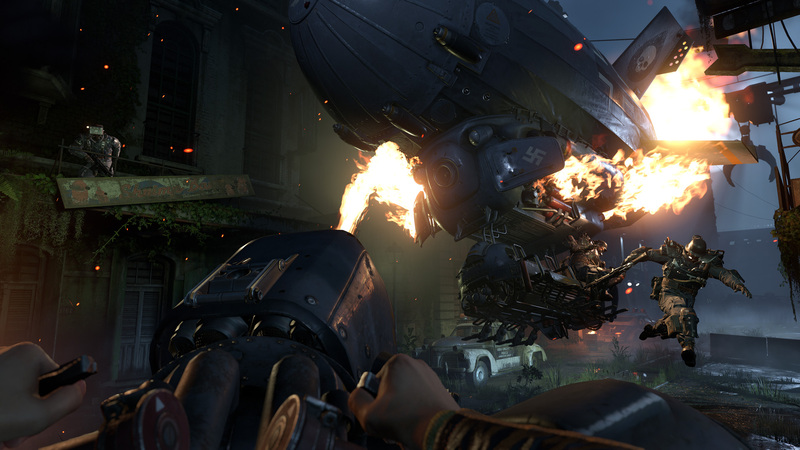 Other notable performances in The New Colossus are Debra Wilson as Grace Walker, Gideon Emery as Fergus Reid, and Glenn Morshower as Rip Blazkowicz. I could and should go on, but it would be easier to list the characters that aren’t spectacularly played. I’m truthfully not sure if there are any. Their performances, of course, depend heavily on the writing, and The New Colossus is one of the best written games this year, if not one of the best written in recent years. Each character is unique and few, if any, are purely good or evil. Even the monsters can be compassionate or vulnerable, and the hero can be the most brutal of them all. People are complex, and the characters and dialogue are written as such. Still, MachineGames never lets you forget that, although evil people can display characteristics like those who are good, there is a clear right and wrong side in this fight. The in-game music feels like it is either taken directly from The New Order, or was built on a foundation laid by that game. It’s similar, which is fine. It still does a good job of giving you a subtle nudge when a cinematic turns from somber to almost Nazi killing time, and it lets you know when you’ve cleared an area of enemies and can relax while you scour for supplies and, obviously, collectibles. The sounds of combat are also good, but I wouldn’t put The New Colossus in elite company. There’s usually far too much going on for the player to have an opportunity to enjoy whatever small details there could be. Once things spin out of control, there are sirens, robots, dogs, frickin’ laser beams, and Nazis screaming as Blazkowicz uses his hatchet to turn their limbs into kindling. Hard to pick up on the cool sound of a magazine swap when all that chaos is going on. The cinematics are movie quality in most cases. They not only help to drive the plot forward, but they also break up the violence and help the game pace itself properly. They can range from heartbreaking to something like a pre-game pep talk, often in the same scene. It occurred to me more than once that this could be a movie, although I quickly decided Wolfenstein was ours. Gamers only. Not that I get a say. Visually, I was neither impressed or disappointed. I played the game at 2560x1440 on PC and locked my FPS at 60. It ran flawlessly with all settings cranked as high as they could go, and it was one of the lighter games I’ve ever played on my PC under those circumstances. It certainly lacks the breathtaking visuals of something like The Witcher 3: Wild Hunt (my gold standard for many gaming related comparisons), but I don’t feel that the game suffers visually. It’s tough to get beauty like The Witcher 3 when your setting is primarily Nazi military installations. My primary visual beef is with the lighting. I believe MachineGames used blinding light as a way for your foes to gain an advantage in some cases. Too often I would have trouble seeing entire sections of rooms because of a blinding light pointed at me. I get it, but I want to see in my games. Find another way to simulate difficulty, because any time I’m picking something up only because I see the prompt, you dropped the ball. Thankfully, this doesn’t happen often enough that it ruined anything for me. Was I Righteous and Just? My problems with Wolfenstein 2: The New Colossus are found in the gameplay, be it combat mechanics, audio, or visual. Even then, those complaints are very minor. While I think there could be improvements, I don’t feel that any of those shortcomings took away from my experience. I thoroughly enjoyed almost every minute of the game, and it wasn’t until I began to analyze things afterward and on my second pass through that I took note of some minor details. I loaded up Wolfenstein 2: The New Colossus and expected to find something that was fun and outrageous with its violence. I got that, but I was shocked at just how much truth it had in it when dealing with good versus evil and hate versus love. MachineGames gives Nazis the middle finger over and over and it’s glorious the entire way, but it also deals with the complexities of some very real issues that will touch a nerve for many who play. Maybe I’m being dramatic, but Wolfenstein 2 was the game that I needed right now. It arrived and unapologetically kicked Nazis in the face at a time when certain world leaders refuse to do so. I needed a single player game to remind me that quality storytelling is still worth years of developer resources. When loot boxes are falling from the skies in World War II, and everyone needs to sell you meaningless crap through microtransactions, Wolfenstein 2: The New Colossus gave me an experience that was deep and entertaining. Personally, it’s probably in my top five games of all time. Very good and thorough review. Yo, yo, yo! You get three of those because I had to use at least five characters. I agree with some other reviewers who said it's an important game, not just a very good game. In a medium and genre where most works are entertaining but intellectually vapid escapism, The New Colossus builds substantial characters and shines a light on some unpleasant social and historical realities. It deserves support from anyone who cares about such things in games. Anyway, I found that once you go "loud", the game really pushes you to dual wield guns. In particular, if you're discovered before you kill all the officers, you need to push hard to blast through the enemies and take them out. After that you have more ability to take it slow and pick dudes off. It was a very emotional game for me. Right from the opening cinematic, I felt like I knew how Blazkowicz felt. Even more after one particularly crazy fight in the middle, if you recall that. Not that I could relate to him based on personal experience, but the voice acting from Bloom connected with me like few characters have. Yeah, it was a pretty emotional game. I took the Wyatt timeline, and his speech at the end choked me up. I took Fergus because that's who I kept in the last game and I assumed he would cuss a lot. I have to play through as Wyatt at some point soon. Special recognition should be given to Max Hass's dialogue in this game. It is fantastically written. Max Hass Max Hass Max Hass. Max Hass!!!! Max. Hass. The chess scene was fantastic. What was the deal with the device from Spesh's lab that BJ gave Set Roth who then pretty much only talked about it the rest of the game? It just feels like it was a plot line that got completely dropped on the floor, or will be either in follow up DLC or the next game. Or did they explain and I completely missed it? I assume it will be relevant in a future game. It's never explained. Wasn't explained to me. They did make kind of a big deal about it and then, nothing. Maybe it comes up with the enigma missions? I only did one of them so far. Yeah, they kind of pulled a Chekov's gun without the delivery. I completely forgot about that... yeah they never did anything with that as far as I'm aware. I can only guess when the Vault unlocks tomorrow, which coincides with the countdown timer on that sub door, there might be some extra mission that explains a little more? Good point. I forgot all about that. Now I'm curious. Good article, and glad to see something posted that doesn't rush a review to market but takes its time to understand the game. On a side note, the name 'terror billy' just seemed out of place. I assumed the silliness of the name was deliberate. A subtle illustration of the Nazis not really understanding American/English language and nicknames. Yeah, I think the suckiness of the nickname highlights the suckiness of Nazis. Man, my pc could run this game looking and running as smooth as perfection, but I’m holding out to see the Switch version, because portable gaming is super important to this old man who’s hardly home.